Any time you start working on your lighting, it is important to differentiate between different light bulbs. Incandescent bulbs, for example, come in bright, yellowish shade. Even though the hue is nice for the eyes, an incandescent light build is one of the least energy efficient light sources. Diode lights, normally featuring a cold blue shade, are a more energy efficient option. LED lights are another eco and energy-friendly idea. Plus, there are about 16 million different shades in the LED spectre, so finding a perfect hue to your liking should not be a problem. Speaking of different light shades, stick to the same hue once you have chosen one. While it is sometimes possible to mix different light shades in a large garden sticking to the same hue is one of the options that will never go wrong — especially, if the garden is small. While you should better not mix different light shades, you always have a chance to play with your brightness levels. Make sure the choice is strategical, though. That is, pick the brightest outdoor lights for the areas that require more illumination. Sure, to position the lights strategically, you will first of all have to break it into functional areas. Your pool, your porch, and your outdoor dining area — all of those are different zones, and each one should be highlighted separately. Another suggestion on how to choose outdoor lights for garden would be to mix different light sources. Even though all of them should, best of all, come in the same shade, the actual designs may differ. 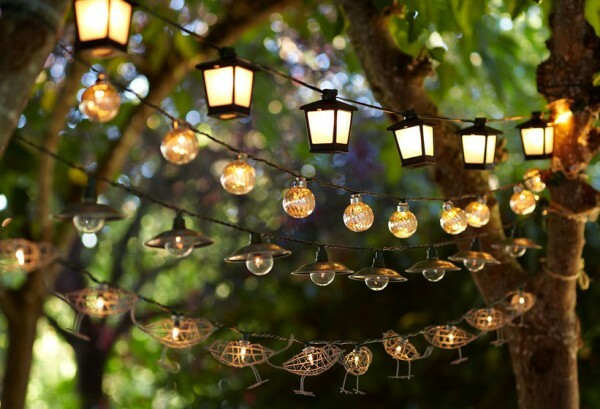 For example, you can mix spotlights on your porch with retro lanterns in your garden dining area. Whichever outdoor lights you choose, do not be afraid to experiment with bold designs. Just like any room can benefit from a bold chandelier, a garden or patio will shine with an unusual lantern or a spotlight— perhaps, even a designer one. Sure, there is more to outdoor lighting than that. For example, it is possible to combine not only various light sources and lantern designs but also illuminate your pathways and even flower beds. Arranging lights in layers is also an option. For more ideas on the subject, take a look at this quick guide — it will teach you a couple of simple tricks on how to give your garden a truly magical look.